The ULTIMA series of hydraulic pumps from Enerpac (A Division of Actuant Corp) saves time and effort on maintenance tasks conveniently and cost-effectively. The two-speed high pressure hydraulic pumps can be employed to power the multitude of labour-saving tools found in workshops and worksites. In addition to being more compact than low pressure models, these pumps are also lighter and quicker to set up for tasks including lifting, cutting, clamping, pressing, forming, aligning, nut splitting and pushing and pulling mechanical components such as bearings and seals. The compact pumps are also capable of packing more power into a smaller and more portable frame. In addition to ease-of-use and safety, ULTIMA hand pumps are constructed for superior durability and longevity. 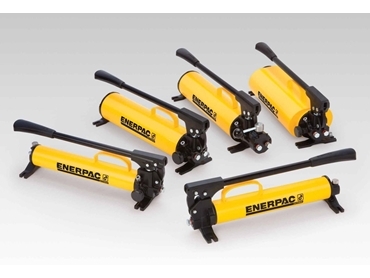 The new Enerpac ULTIMA series of steel hand pumps features a two-speed operation wherein the faster first stage can be used to quickly position the plunger of the hydraulic cylinder before employing the powerful second stage (700-2800 bar) to do the heavy work. The chrome-plated plunger protects against wear and withstands contaminants. Weighing as little as 7kg and designed for portability, the versatile new generation steel hand pumps are ideally suited for rugged applications where durability is of utmost concern. Enerpac National Sales Manager Darryl Lange says that the pumps can comfortably handle cylinders of 5-25 tons capacity or more, while withstanding rugged sites and rough treatment.